The Nilfisk Buddy II 18 is a small, lightweight, yet powerful helper for picking up Wet & Dry debris... for your home, car, workshop, hobbies and even for outside cleaning. With electrical outlet it build in it is very convenient cleaning up after 'do it yourself' task. Nilfisk Buddy II 18 – the second generation – has a container capacity of 18 litres. The light weight and compact design makes it handy working with. 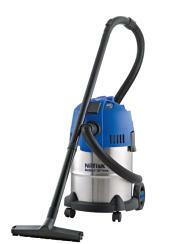 The Nilfisk Buddy II 18 T makes it handy working with power tools and removing dust and dirt in the same process. Attach your power cord to the machine and connect the suction hose to your power tool with the included power tool adapter. 1200 watt motor will pick up any debris you want to get rid of. Two big wheels at the back and two rotation wheels in front make the machine very stable and easy to move around. The standard wet filter protects your turbine for a long lifetime. The built in accessory holder provides storage for your accessories so they are always at hand. Ergonomic grip so you will have a balanced machine when you carry it around. The grip is shaped so you can place the tube on top when having a break.